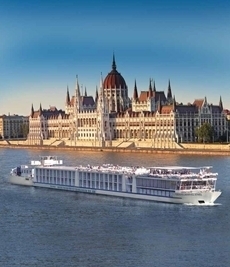 The Concerto River Ships are some of the finest vessels you will find on Europe’s waterways. Guests can expect a wealth of exclusive amenities and spacious suites with private minibars and well-appointed en-suite bathrooms. With a huge array of dining options on board, fantastic entertainment most evenings and a host of European itineraries, a trip on board one of Concerto’s luxurious River Ships is sure to be the holiday of a lifetime. There are seven different cabin categories to choose from, ranging from the Twin Window Suite, which measures a relatively modest 160 square foot, to the Owner’s Suite, measuring a whopping 350 square foot. All of the cabins boast luxury queen-size beds, flat screen TVs, Wi-Fi access and much more. The top category cabins also offer panoramic windows, spacious separate lounge areas and an open-air balcony, complete with deck chairs and footstools – perfect for watching the world drift by. With seven alternative dining options, you’ll never be short of gastronomical delights to tempt your palate. Head to the Verde Fine Dining Restaurant for freshly prepared gourmet cuisine throughout the day and the Sun Deck to enjoy a sun-dappled lunch while watching the highlights of Europe drift by. If you’re looking for something a little more prestigious, Chaîne des Rôtisseurs is considered one of the world’s most prestigious culinary options. This on-board restaurant serves up mouthwatering food, it will leave you talking about it for years to come! Whether you are looking for Italian fare, a casual lunch or private dining, you’ll find them all on the Concerto River ships. Why Cruise on Concerto River Ships? These stylish and sophisticated ships will see you traverse Northern Europe’s finest rivers in complete style and comfort. There is a whole host of fantastic itineraries to choose from, including a romantic 8-day excursion along the Rhine (which passes by chocolate-box houses, gabled streets and various sites of great historical significance) and a 15-day cruise from Amsterdam to Budapest (which takes in three different rivers and five different countries, not to mention Germany’s finest wine regions and the beauty of Budapest).